The trail heads are located at the Harris Bridge take out area and Hidden Lake area. To access the trail head: Each trail head is located near the parking area. The trails are pretty easy. The hardest part is the 1/3 mile bluff overlook trail because it's a bit steep. Narrows of Harpeth:Starting at the Harris Bridge take out area, start hiking alongside the river, crossing under Harris Bridge. 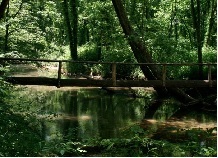 You will hike along the river until you reach a wooden foot bridge. Cross over the wooden footbridge and continue alongside the river. Once you pass under some high bluffs you will be close to the Bluff Overlook and Tunnel Trail. The Bluff Overlook is about 1/3 mile and a bit steep but it will take you to the top of the bluff, giving you a great view of the Harpeth River Valley from above. The Tunnell Trail will take you to the man made Tunnel that was built many years ago to harness the power of the Harpeth to use for making iron. The tunnell has water flowing through it. After hiking back to the parking area you will want to go check out the Hidden Lake area. Hidden Lake: The Hidden Lake area speaks for itself. There is a like, hidden from view of anyone passing by on the Harpeth, that was once used in the 1920's and 30's as a resort area. From the parking area it's a short easy hike to the lake, just follow the signs. There are a few other trails you can loop through as well. At the Narrows of Harpeth you will get a great view of the valley from atop the Bluff View trail. At the Hidden Lake area you will view a scenic lake. Harpeth River State Park is best known for it's canoeing. There are some good put in and take out points to give you easy access to the river. There are also maps available to show you the sections you can canoe from each point. There are a few canoe rental places near by as well. Each parking area also has restroom.